Spinner wheels are specially engineered to be smooth and silent for effortless transport. Designed with a little more room for packing extra or flights in larger planes, this smart-looking carry-on features convenient USB charging capability. Fits International airline standards, and perfect for smaller commuter jets. The Cupertino hardside luggage collection was designed to protect your travel wardrobe with a TSA-recognized lock. The largest size in our San Clemente 2.0 collection gives you maximum packing room for lengthy travels. Carry-on most domestic airline standards and fits 1-2 suits. The Ricardo Sausalito 25 inch Spinner Upright in Midnight Blue is ideal for a 5-7 day trip. 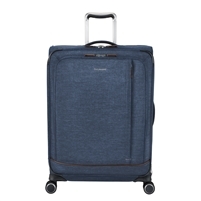 The Ricardo Sausalito 25 inch Spinner Upright in Blue Twist is ideal for a 5-7 day trip. This three-compartment check-in suitcase is ideal for long-length trips. The Ricardo Ocean Drive 21 inch Spinner Carry-On in Sandstone is legal size for most domestic flights. Looking for a specific Ricardo Beverly Hills spinner bag? Please don't hesitate to ask and we will find it for you!